Although contemporary art may sometimes shock us, more alarming are recent attempts to regulate its display. 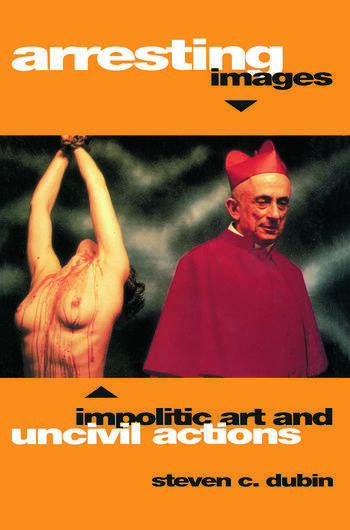 Drawing upon extensive interviews, a broad sampling of media accounts, legal documents and his own observations of important events, sociologist Steven Dubin surveys the recent trend in censorship of the visual arts, photography and film, as well as artistic upstarts such as video and performance art. He examines the dual meaning of arresting images--both the nature of art work which disarms its viewers and the social reaction to it. Arresting Images examines the battles which erupt when artists address such controversial issues as racial polarization, AIDS, gay-bashing and sexual inequality in their work. Steven C. Dubin is Associate Professor of Sociology at the State University of New York, Purchase, where he directs the Social Sciences and the Arts program. He is the author of Bureaucratizing the Muse: Public Funds and the Cultural Worker.